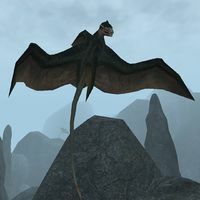 Creatures serve many uses throughout Mundus and Oblivion. Some serve as beasts of burden for carrying people and cargo, such as the horse or the guar. 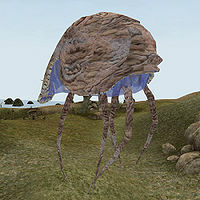 Others are used for war, such as the clannfear which are often used as summoned creatures to defend mages or as soldiers in Daedric armies. Undead creatures such as the zombie are often used as guards or as experiment subjects by necromancers. It is common for animals and monsters to be hunted as food or for their fur, bones, or alchemical properties. In some cases they are even used as building supplies, most notably in the case of the Redoran city of Ald'ruhn where the Redoran Council maintains a Manor District under the shell of an Emperor crab. Some animals can also serve as pets, an obvious case being the dog. In some cases they are used as a work force; the goblin is often used by the Altmer as a work force, and in some cases certain other creatures such as the ogre are enslaved and made to live a life of forced labor. A creature may serve one primary purpose, but that does not mean its role is set in stone. Many creatures can serve as food, pets, wildlife, or as mindless monsters to be slain or avoided whenever found. Though an animal or monster can alter or even damage its environment and ecosystem, its chosen ecosystem is often necessary for its survival. A creature chooses to live where it can survive, which means that its environment must complement their abilities or lifestyles. Skeletons and other undead can often be found in ruins or in necromancer lairs. Slaughterfish and the dreugh can be found underwater. Esta página foi modificada pela última vez à(s) 19h32min de 2 de setembro de 2017.